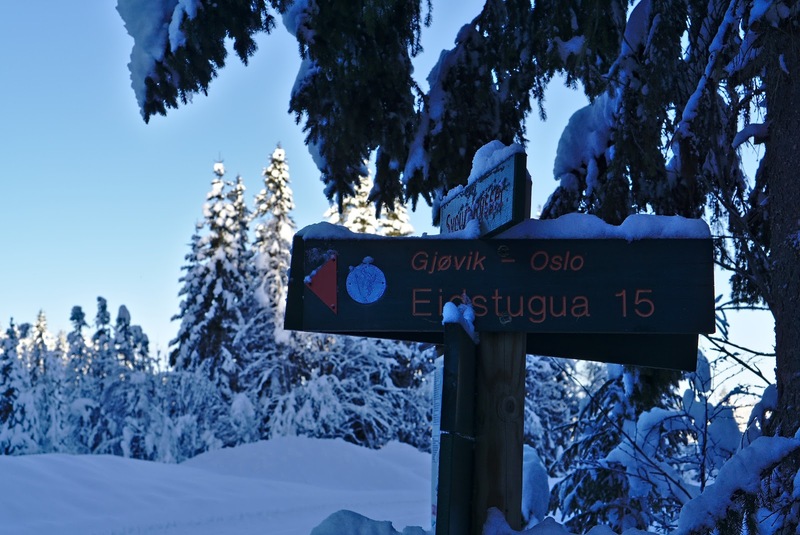 Five brave adventurers boarded on the train to Gjøvik on Saturday morning with skis and backpacks full of snacks. We weren't the only skiers on board the train, which offers unparalleled access to the far reaches of the forest north of Oslo. Stop by stop, all the other skiers got off until only we - me, Audun, Vibeke, David and Henrik - remained. 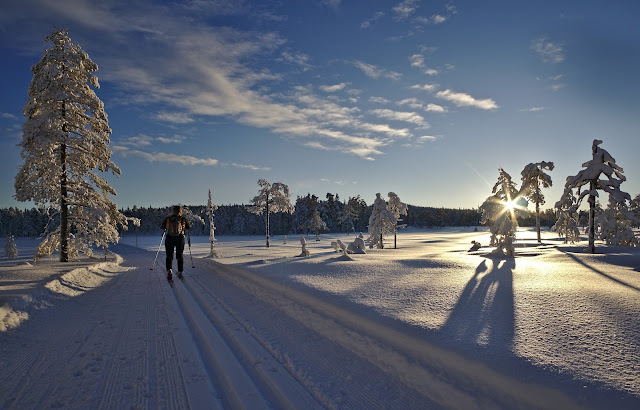 We had taken the train so far north it was hard to imagine one could ski all the way back to Oslo again. The sun lit the tops of the trees as we set out from Raufoss. The early hours were full of optimism and joy. What a day, wasn't in magnificent? Skiing seemed so easy, we would practically fly home to Oslo, I was sure. My hands went numb to begin with but quickly warmed in time with the crunching snow under my swinging poles. 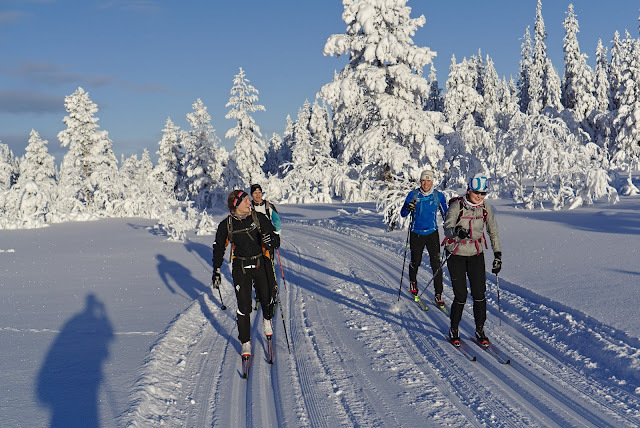 The ski back to Oslo is in excess of 130 km, and we planned to complete it over two days. 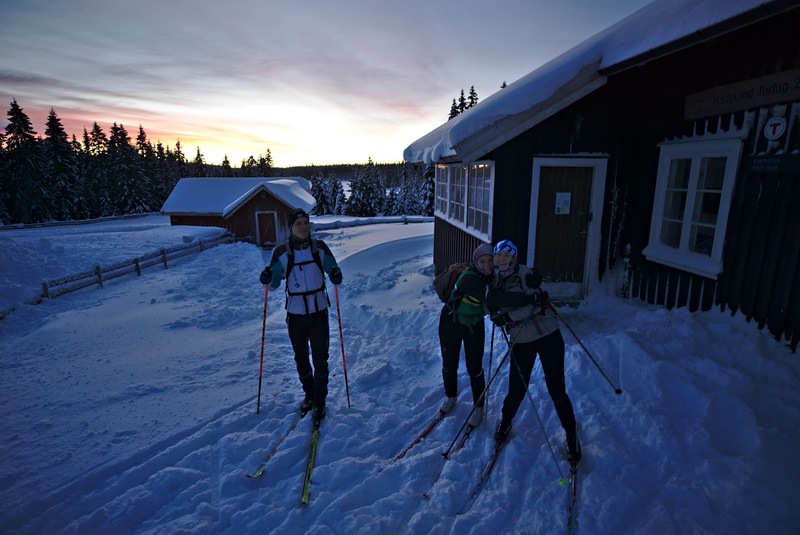 We wanted to spend the night at a cushy hotel in Lygna, but unfortunately the Norwegian national biathlon championships were being held that weekend, so there were no rooms available. We settled on a tiny DNT cabin 15 km south of Lygna, which would offer somewhat more rustic accommodations. Our ski took us through the middle of no-where. We only saw a handful of other skiers all day, which would never happen closer to populous Oslo. After following broad tracks for the first hour or so out of Raufoss, the trails grew narrower and narrower until they were just a single track plowed by a snow scooter. 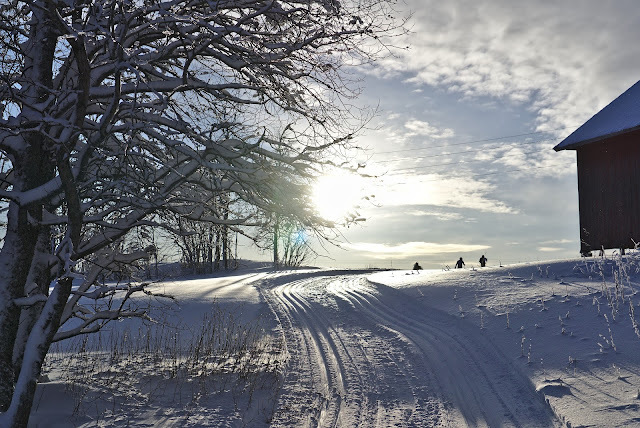 The scooter tracks were prone to driving bumpier, more challenging routes than a groomer would, and this felt like real adventure skiing somehow. It was a chilly day and the rays of slanted sun were too weak to provide any real warmth. I struggled to eat enough. Every time I wanted to eat I had to stop, take off my backpack, and usually take off my gloves. All of the blood would withdraw from my hands as I started skiing again, and it would take 20-odd minutes to warm them up completely. I definitely need to find a way to make have easier access to snacks on a long ski! I was glad when we hit a long uphill that stoked my internal furnace. We weren't moving fast, though, far from the 10 km/h we had thrown around while talking on the train ride. I began to feel the mental restlessness that comes during a long outing. I couldn't help glancing at my watch, registering how far we still had to go, and wondering if we would really get there. I had to settle in the to the rhythm of acceptance, to find the zen of knowing that as long as we continued to move forward we would get there. At some point. The trail hit a long flat stretch, crossing several open areas that must be bogs in the summer. The sky was orange on one side and purple on the other, a mark of impending dusk. I found my stride and I skied along, faster and faster. I felt like I was flying, and all of a sudden I turned around and my companions were no where to be seen. They had stopped for a snack and I hadn't even noticed! 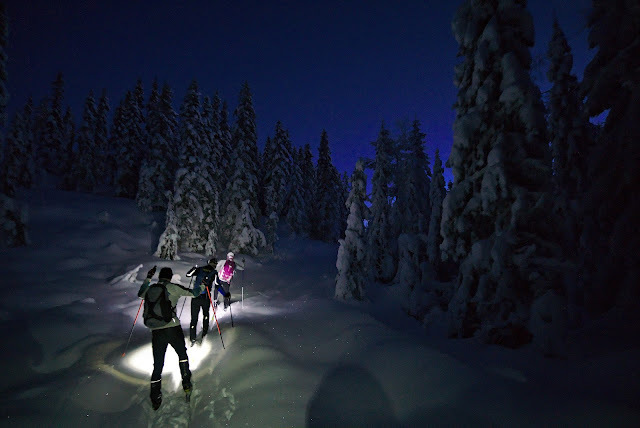 The sun set at 3:30 pm, and we took out our headlamps not long afterwards. We were closing in on the dreaded red section on the map, the section that had not been previously tracked. 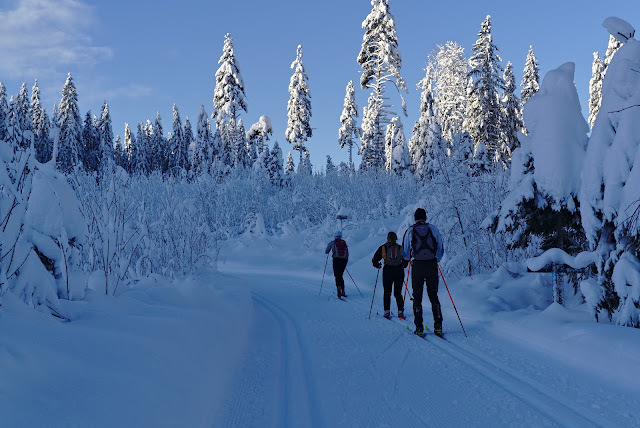 The ski trail was an open strip through the forest. We rotated leads, making slow first tracks through the deep powder. The world was narrowed down to what was illuminated by the beam of my headlamp. Deep tracks revealed that a moose had meandered back and forth along the ski trail. I hoped I didn't run into him around a corner! Feather marks in the snow showed where a bird had taken off. Other than the animal tracks, the world was pristine and white. I was breaking trail when I saw a signpost in the distance. As it drew closer, I realized a ski trail ran past it and gave a whoop of joy. The going was about to get a lot faster! The final kilometers to Lygnasæter passed quickly, and soon we were crossing the first road all day and entering a warm restaurant. 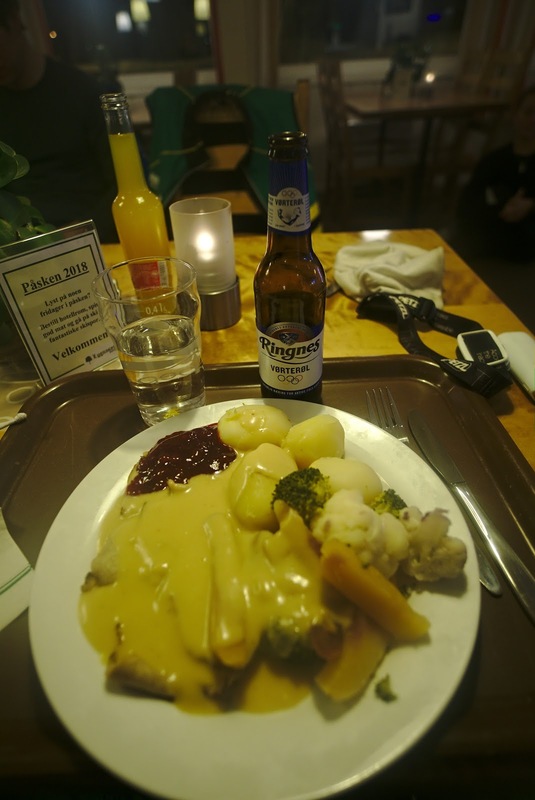 Lygnasæter served enormous portions of dinner, and we spent an hour contentedly filling our bellies and stretching. But the day wasn't over yet. 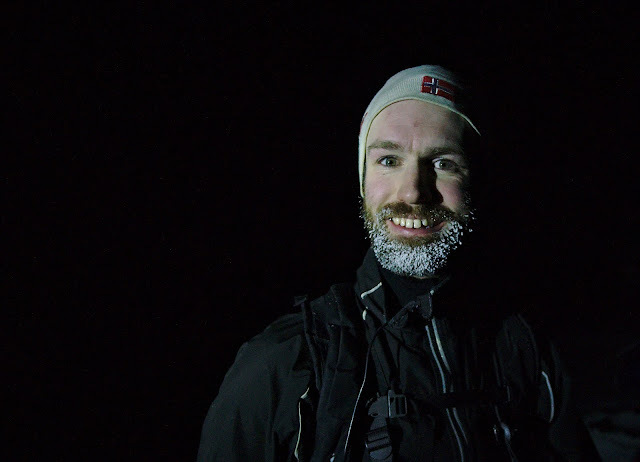 Buoyed by supper, we headed back out into the cold for the final 15K to Sagvollen. The night sky was spangled with stars, and the snow glittered in our headlamp beams and squeaked under the pressure of our poles. I was very tired, but my body seemed to have adapted to constant motion and continued to ski without input from my brain. We reached the unserviced DNT cabin of Kjørestua around 9 pm, after skiing just shy of 69 km, by far my longest day on skis ever. The cabin was freezing, and we quickly set about stoking the fire before heading to bed. Tomorrow would be just as long. We meant to start early the next morning. I got up first, and began to melt snow for breakfast and drinking water. Unfortunately, I melted way too much snow and we waited for almost a hour for the water to boil. 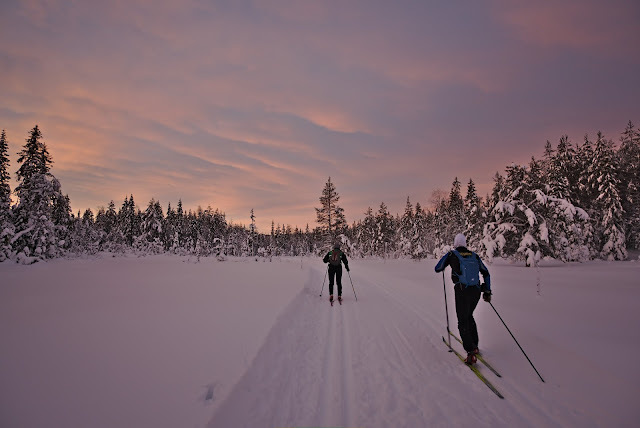 I felt angry with myself for delaying our departure, although it was still just before sunrise when we locked up the cabin and headed out on the ski trails. As we began to ski, my hands froze solid. This was by now a familiar feeling, and I knew my internal furnace would warm them up if I continued to move. We were treated to a beautiful sunrise. Our first goal for the day was Grua, a train station where we would be joined by another friend. Many of the kilometers to Grua were on challenging, rolling scooter track and I felt mounting fatigue compounded from the day before. I thought about how far we had to go, and how much longer we would be skiing for. I thought about how easy it would be to get on the train, to go home and lie on the couch. By the time we got to the train station I was mentally finished. I knew I could ski the last 50 km to Oslo, but I simply didn't want to. I was content to go home and spend the afternoon watching Tour de Ski. I spent some time being disappointed and angry at myself - Don't I always write about overcoming challenges? How could I possibly write that I quit? But when I woke up on Monday morning full of energy, I realized it was the right decision. Despite bailing at Grua, the weekend's adventure had been my longest ski ever, and had challenged me mentally and physically. And maybe someday I'll go back to do the whole thing! You don't have to "prove" anything. The line between enjoyment and execration...enough and too much, is thin. Sometimes it is wise to error on the side of enjoyment. Thanks! I agree, it's just sometimes it feels like you have to have some valid excuse not to finish.